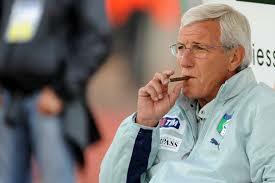 Marcello Romeo Lippi looks calm, smoking a cigar while keeping his eyes on a match. He remains inhaling the cigar amidst dozens of cameras shed some light on him as the match is over. He’s not the kind of coach, like Antonio Conte, who shouts on the edge of the field to give instructions or motivate his players throughout the game. He won’t push his coach rival, as the one happens to Arsene Wenger and Jose Mourinho, should he get angry with referees’ decisions deemed unfair for his side. And he’s not the type of trainer, like Mourinho, who sometimes loves to ignite war of words prior to important matches probably for the sake of media sensation or for downgrading opponents’ mentality. Surely, sometimes he may get involved in arguments with referees but he rarely makes impolite or harsh comments let alone leaves his players in response to the unjust decisions. His relaxed countenance, observant traits are attached for the coach whose playing career is way below his glittering coaching one. 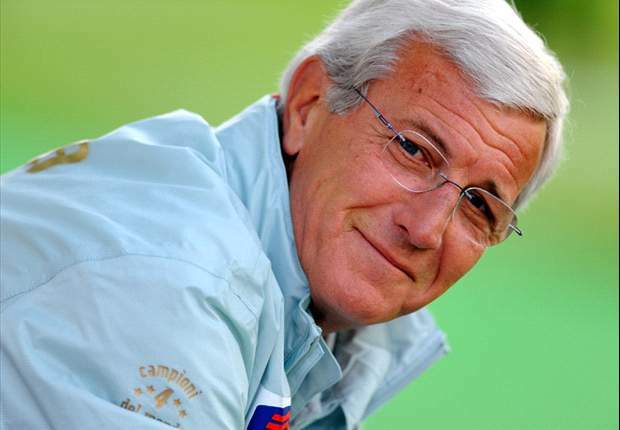 A well-respected man, a cold-headed coach, a bit controversial guy, a creative and very smart person, there is so much to say and learn from Lippi. I have a kind of mixed feeling the first time I know about Juventus and him back in 1997. I am amazed with his 4-3-1-2 formula that is able to bring the Old Lady as the queen in Italy. In the 1990s, he, too, brings the club to be best in Europe. 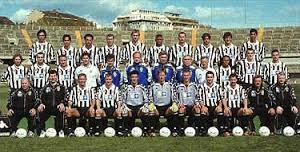 Back then, Juventus has very solid and strong team. You can recall the names of best defenders at that time; Ciro Ferrara, Paolo Montero, Alessandro Birindelli, and Gianluca Pessoto, to name a few. In the middle part, current Italy’s coach Antonio Conte becomes the team’s captain along with Alessio Tacchinardi, Angelo Di Livio, Didier Deschamps, Edgar Davids and the playmaker Zinedine Zidane. In the front line, you should never forget the sharp duet Alessandro Del Piero-Filippo Inzaghi. 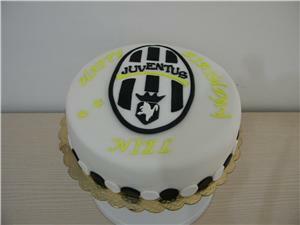 You may call my love to Juve and Lippi is always meant to be probably before Alloh Swt sends me to this beautiful world. When I first watch this club, this is the squad that completely steals my heart away, it blows my mind away, and nothing can beat them. They remain in my heart until now. I can always recall they way the play. With the four walls in the back; creative and persistent midfielders and super quick, compact duo in the forefront. That is the best of Juventus. 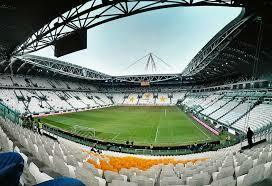 That remains Juve’s most memorable that leaves such deep impressions in my heart. And that comes to life thanks to the magical touch of a wonderful, smart and creative coach namely Marcello Lippi. Watching, learning and absorbing his playing method enrich me already despite the fact I am such a newbie football fan at that time. The first and foremost lesson I put in my brain ever since my first experiences watching the team is that how Lippi really shows me that football is all about team unity. Set aside price tags, star status that commonly attach to certain players. When footballers play for the black-and-white jersey under the helm of Marcello Lippi, they have to fuse into the one Old Lady. I used to misunderstand him. Initially, I hate him for opting Ale instead of Filippo or Pippo as his first choice in the front line. I have clear argument on why I choose Pippo as he scores more goals than Ale. But as the 1997/1998 Serie A progresses, I gradually learn Lippi’s reason: Ale is much more creative and tenacious player. He can go down to aid his fellow defenders, he is helpful in the middle field and definitely, he is hungry to score goals. That’s from my point of view. 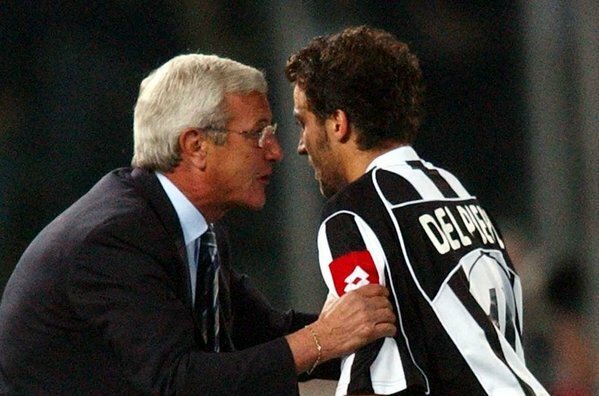 From Lippi’s perspective, he depends on Ale may be because Ale is ‘always ready on call’. I hardly say Juve’s Lippi as a boring team strongly links with Italy’s defensive system. It has balanced squad from the back to the front row. Juve is just the team as attractive as those from other European countries. When I say he is cold-headed I mean it though I, again, get information somewhere in the media. 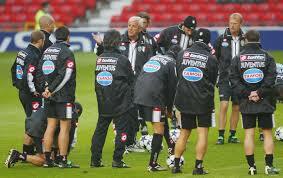 But enough to say, to establish a united team with a very strong vision, Lippi has to be very bold. I can’t explicitly look at his ‘cruelty’ in the camera but I firmly believe he is open to his players, if not in the field then may be in the changing room or during training sessions. And that is inevitable for shaping a winning team. In another word, that is a must. Giving his coaching skill at Juve, I surprisingly don’t hate him at all when he takes a controversial decision to leave Juve for Inter Milan, the Old Lady’s eternal rival both on and off the pitch. I put high respect on him despite the decision because Lippi is the first coach who shows me how to choose an idol based on his achievements. He teaches me on how to put my feet on other people shoes. So, when he briefly leads Inter in 1999-2000, I regard that he yearns for new challenges. And I think that is so normal. Looking at this event, I don’t hate Conte for leaving Juve to coach the Azzuri national team as I try to put my point of views from Conte’s; that he looks for adventures. Later on, I learn that Lippi actually leads me to be a completely objective Juventini and try not to be such a narrow-minded one. 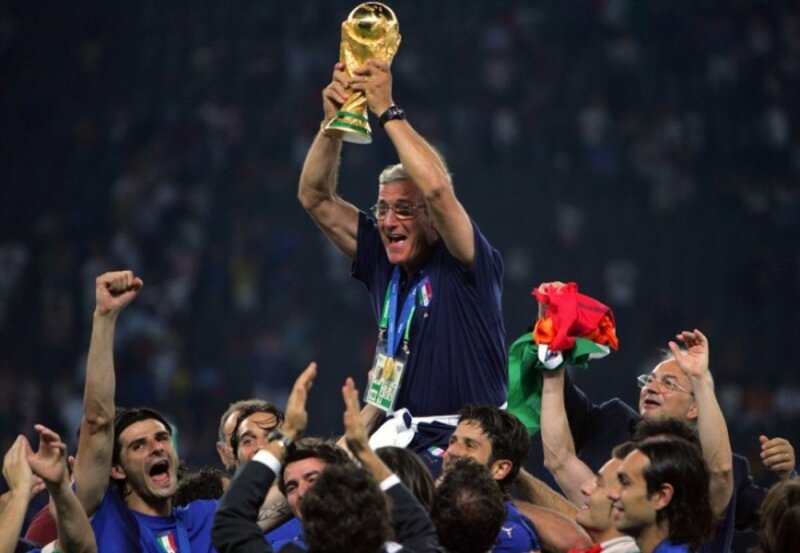 The peak of my admiration for Lippi comes to its climax when he leads the Azzuri team to win the 2006 World Cup. It’s so remarkable. I am speechless to utter how his and the team achievement feels like, as Ale puts in his book ‘Playing On’, “reaching the top of the mountain.” Specifically, at times of calciopoli hits the Serie A teams, Lippi’s capability is tested to the most. With so many serious problems plaguing the national team, Lippi is able to turn it out into something so great. 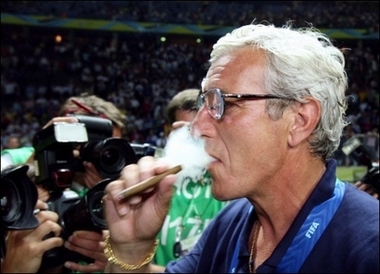 This victory shows Lippi’s just another superb skill; psychology. What he has done to the team despite the hard times it faces along with the not-so-many expensive players is way too marvelous. The way he makes use the negativity to a strong motivation that eventually creates a world champion is outstanding. That, again, shows Lippi’s psychological skills which I have not initially thought of given his quiet appearance. Even after his downside following his total failure in the 2010 World Cup campaign I don’t despite him at all. He simply remains a human being who lives with achievements and failures. And his defaults in the 2010 World Cup campaign do not taint his accomplishments four years back then. He stays the best and will always be. The last point is how he garners respect from fellow coaches, the most famous one is Sir Alex Ferguson. I dislike Fergie, to be totally honest. 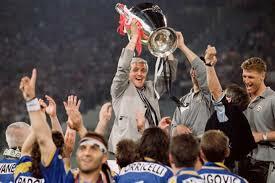 But Fergie admits he takes so many lessons from Lippi on how he builds Manchester United’s best team in 1990s. How flattering yet so startling! But still, I dislike Fergie and Manchester United. For me, Lippi is like a book without any closing chapters. He has so much inside his brain. He’s got the nerve, the winning mentality, the smartness, the creativity and the guts to be a phenomenal coach. So when he decides retiring from the football world I feel so devastated. The fact that I don’t watch him being in the edge of the field during his last three years with the Guangzhou Evergrande adds another sadness into my already bitterness. Apart from these below greatness, I will surely miss his coaching philosophy and serene behaviors. I’m so fortunate to have witnessed his skills that will serve as priceless heritage not only for the Italy but to the football industry in a large extant. 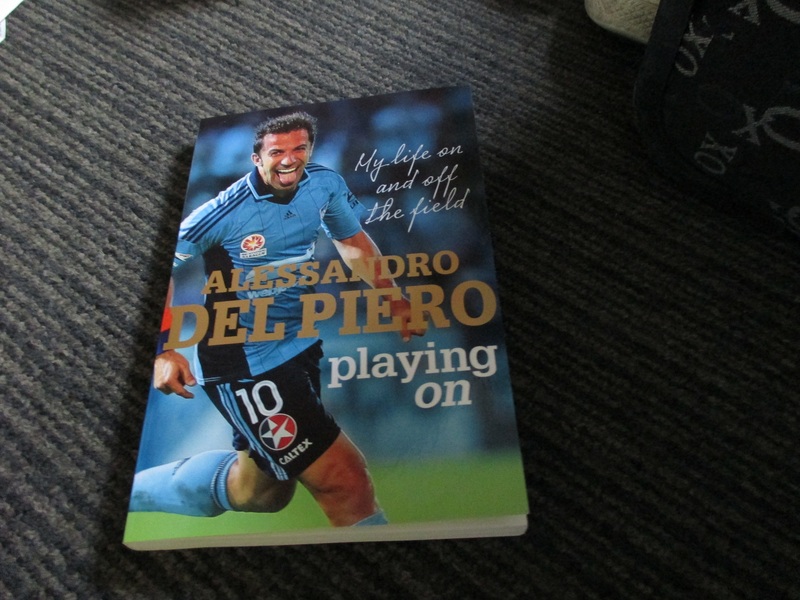 For myself, I hope one day I will meet him in China or in Italy, just like I have met Ale in Sydney, Australia. Grazie millie Mister Lippi! For everything! I’m glad you are still within the football industry as Guangzhou Evergrande as a technical director. Not only that will leave me with abundant stories to be written later on but also that shows you are always on with new challenges despite your old age. And you know what? That makes you are completely, thouroughly and wholly AWESOME! Aku tergelitik ingin mengamini pernyataan Ale dalam bukunya ‘Playing On.’ “Ingatlah ini hanya permainan, Alex. Maksudku, aku tahu sepakbola tak sekadar permainan, dalam profesi dan hidupku, tetapi aku juga paham betul bahwa sepakbola tetap saja adalah hanya permainan.” Demikian ungkap batin Ale dalam bukunya tadi. Terkadang aku juga berpikir mengapa ya aku hingga sekarang bela-belain bangun dini hari demi menonton Juventus. Bahkan, hal tergila baru saja aku lakukan: buang uang puluhan juta demi bertemu Ale di Sydney. Sulit bagiku untuk menjelaskan kepada beberapa teman atau kenalan yang terkejut saat aku berkata aku menghabiskan banyak uang demi Ale. Ada yang tetap kaget saat aku bilang aku ke sana demi Ale, namun ada pula yang langsung memaklumi mengapa aku mempunyai alasan yang tepat. Ini sama susahnya menanggapi komentar beberapa teman yang mengutarakan pertanyaan retorik: mengapa tidak dikasih saja satu pemain bola itu satu bola daripada mati-matian mereka hanya memperebutkan satu bola? Kalau sudah urusan cinta dan gengsi, berapa pun dan apa pun akan terasa wajar meski menurut banyak orang akan terdengar kurang kerjaan dan buang-buang uang. Hmmm… urusan logis dan tak logis menurutku relatif. Tetapi, faktanya, sepakbola memang urusan yang luar biasa. Untuk yang Ale bilang sekadar permainan ini, banyak orang bisa mabuk atau gila karenanya. Contohnya ya aku ini. Dan ada banyak Juventini atau penggemar bola lain yang jauh lebih fanatik. Itulah mengapa Real Madrid rela merogoh kocek hingga triliuan rupiah demi seorang Gareth Bale. Atau Paris Saint-Germain harus bersiap membayar pajak fantastis sebagai akibat membeli Zlatan Ibrahimovic. Hingga laga ke-1000 sekalipun, Juve Vs Inter Milan pasti akan tetap menarik. Real Madrid Vs Barcelona akan tetap bisa menyedot media di seluruh dunia. Lagi-lagi, ini urusan hati bung. Langganan TV kabel pun akan dilakukan demi bisa menonton tim kesayangan. 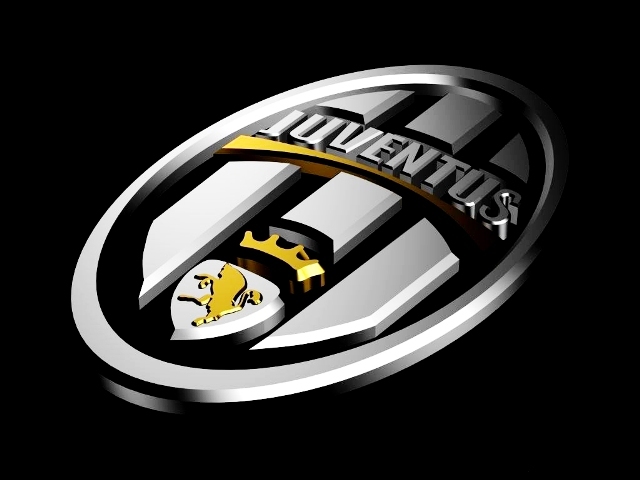 Hubunganku dengan Juventus dimulai secara tidak sengaja dan sengaja. Tidak sengaja karena pada saat itu ayah membelikanku tabloid BOLA dengan sampul Zinedine Zidane. Inti dari artikel saat itu adalah keputusan Zidane yang memperpanjang kontraknya dengan Si Nyonya Tua. Yang membuatku penasaran bukanlah Zidane tetapi Juve. Inilah yang lalu aku sebut dengan kesengajaan. Karena aku memang sengaja ingin menonton Juve demi membuktikan rasa penasaranku. Begitu melihat Juve bermain, aku langsung jatuh cinta dan terus aku pupuk hingga saat ini. 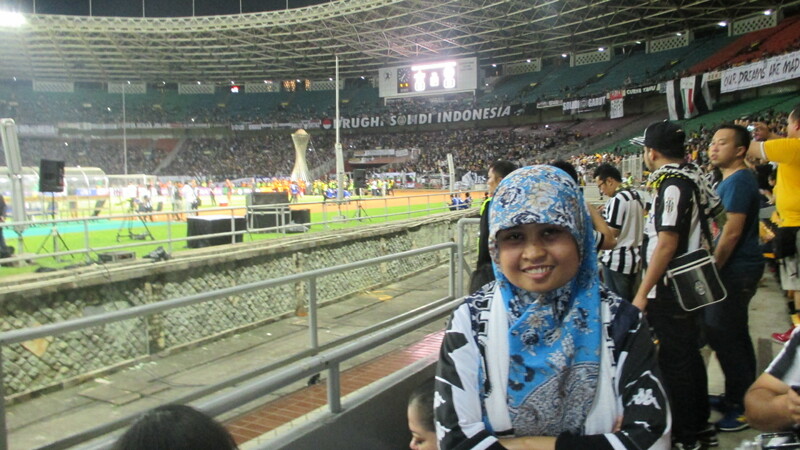 Ada semacam klik antara aku dan Juve yang sulit digambarkan. Yang pasti aku menyukai Juve karena klub ini bukan klub yang gemar membeli pemain super mahal. Entah karena persoalan uang atau apa, yang pasti aku menyukai ciri Juve yang satu ini. Aspek kedua aku cocok dengan sistem pertahanan berlapis baja a la Juve. Mungkin ini dinilai sebagai sepakbola negatif tetapi bagiku aku menyukainya. Ini adalah sifat khas Juve yang harus tetap dipertahankan meski berganti pelatih. Itu hanyalah dua dari banyak hal yang membuatku tak kan pernah pindah hati ke lain tim. Sejak aku mencintai Juventus, ayahku seringkali memperingatkanku agar berhati-hati dengan fanatismeku. Dan yang beliau sampaikan sangat beralasan. Selama sekitar 17 tahun menjadi seorang Juventini, aku menyaksikan diriku sendiri berkembang dan belajar menjadi seorang pendukung yang baik. Tanpa kusadari, pengalamanku menemani Juve saat menang dan kalah banyak mengajariku tentang cara menyikapi kegagalan dan keberhasilan secara benar. Waktu remaja, aku adalah penggemar Juve yang sangat emosional dan fanatik. Letupan emosi saat Juve menang atau stres luar biasa saat ia kalah hampir jadi santapan jiwa setiap akhir pekan. Jika Juve memang tentunya senang bukan kepalang. Tetapi, jika kalah aku bisa malu luar biasa setiap Senin pagi saat teman-teman memperolok atau menyindir Juve. Rasanya, ingin melewatkan hari itu dengan bersembunyi di bawah kolong meja saja. Dan aku sangat membenci Inter Milan. Pemain yang paling membuatku sebal adalah Ronaldo dan Francesco Totti. Aku juga sangat membenci AS Roma dan Lazio. Benci yang sebenarnya benci sampai mengeluarkan sumpah serapah. Hal paling menyedihkan saat itu adalah saat Juve harus kalah dari Lazio dalam perebutan scudetto dalam menit-menit akhir gara-gara hujan yang mengepung lapangan tempat Juve bertanding sehingga gagal menang. Lazio yang akhirnya saat itu keluar jadi scudetto pada musim 1999/2000. Aku juga sangat tidak terima banyak temanku yang menganggap Totti lebih baik dari Ale. Atau bahwa Ronaldo akan membawa Inter juara musim. Kenyataannya, Ale jauh lebih terkenal dan bisa membuat Juve juara meski harganya kalah jauh dari Ronaldo. Saking cintanya aku terhadap Juve, aku sebal sekali jika ada teman yang menjelek-jelekkan Juve meski mungkin maksudnya hanya bercanda. Hal terparah yang aku lakukan adalah aku pernah menangis di pekarangan belakang rumah gara-gara Italia dipecundangi Korea Selatan pada Piala Dunia 2002. Aku stres sekali karena Italia benar-benar dicurangi oleh wasit saat itu. Bisa dibilang itu adalah puncak fanatismeku saat remaja. Selama 17an tahun, aku tak selalu sreg dengan keputusan yang dibuat oleh Juve. Aku masih ingat aku pernah sangat marah saat Juve banyak membeli pemain Prancis, seperti Lilian Thuram dan David Trezequet, setelah keduanya berhasil membawa Prancis mengalahkan Italia dalam final Piala Eropa 2000. Bagaimana mungkin Juve membeli pemain-pemain itu? Tetapi perlahan, aku mulai memahami arah kebijakan Juve dan kesamaan kami yakni ingin menjadi yang terbaik membuatku akhirnya bisa menerima keputusan Juve. Pun demikian saat Juve tidak memperpanjang kontrak Ale. Aku sangat kecewa tetapi ya mau bagaimana lagi. Keinginanku ingin melihat Juve tetap tumbuh mengalahkan rasa kecewaku. 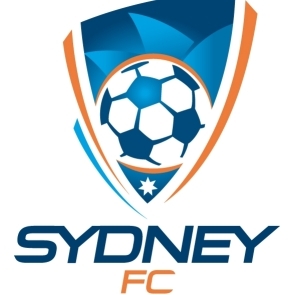 Pelan tapi pasti, aku masih tetap mencintai Juve sembari tetap menyayangi Ale meski dia nun jauh bermain untuk Sydney FC. Rasanya seperti membagi dua cinta yang sama besar kepada dua orang yang berbeda. Tetapi jangan salah ya. Hingga sekarang aku tetap kurang suka sama Trezequet meski dia banyak membuat gol untuk Juve dan adalah tandem pas untuk Ale. Hingga sekarang pun aku tetap membenci Zidane karena memecahkan rekor pemain termahal saat ia pindah ke Madrid meski di Juve dia sangat berperan besar sebagai otak serangan kala itu. Rentang waktu 17an tahun menjadi Juventini membuatku akrab dengan pergantian pemain dan pelatih. Dari sekian banyak wajah, favoritku tentu saja era akhir 1990an. Duet maut Filippo Inzaghi dan Alessandro Del Piero akan selalu menjadi yang terbaik di hatiku sampai kapan pun. Pelatih favoritku tentu saja Marcello Lippi. Skuat yang akan selalu kuimpikan ya zaman Angelo Peruzzi, Antonio Conte, Angelo Di Livio, Paolo Montero, Zinedine Zidane, Alessio Tacchinardi, Didier Deschamps, dll. Semakin bertambah usia kini aku mencintai dan menikmati Juve dan sepakbola secara lebih logis. Tak ada lagi emosi berlebihan seperti dulu. Aku juga tak begitu stres saat Juve kalah. Tiada lagi puluhan poster besar yang menghiasi dinding kamarku. Yang tersisa kini hanya beberapa potongan koran dan tabloid tentang wajah Pippo, Ale, Juve, juga tim nasional Italia. Potongan gambar tersebut kini sudah lusuh dan jelek tetapi hingga kapan pun tak akan pernah aku sobek atau buang. 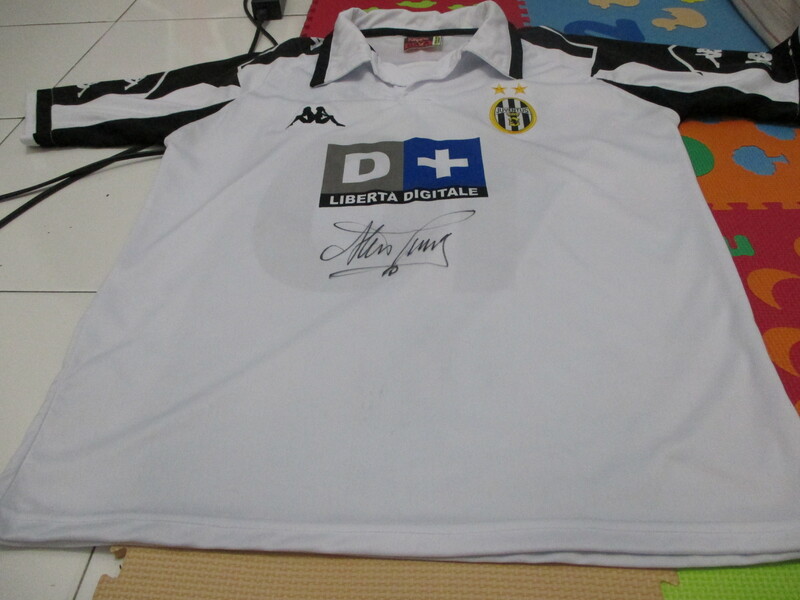 Meski secara fisik aku tak terlihat mengoleksi barang-barang berbau Juventus, aku merasa justru rasa sayangku semakin menggila. Sensasi menikmati gocekan bola pemain Juventus kini jauh lebih berasa. Aku juga heran dengan ini semua karena aku tak setiap hari mengikuti perkembangan berita soal Juve atau Ale karena kesibukanku. Tetapi aku malah tak segan mengeluarkan banyak uang demi mewujudkan mimpi masa remaja, yang meski terkadang aku lupa atau tinggalkan, tetap melambai-lambai ingin tetap diwujudkan. Tahun ini Alhamdulillah sudah bisa bertemu dengan Ale, Insya Alloh tak lama lagi bisa ke Turin, amiiiin. Aku sendiri bersyukur mengenal dan mencintai Juve dan Ale. Bagi banyak orang mungkin akan terdengar sepele tetapi aku banyak belajar tentang mimpi dari menyayangi mereka. Awalnya hanya sekadar ingin ke Turin untuk menonton langsung tetapi lama kelamaan aku jadi ingin melihat dunia. Dan untuk bisa mewujudkannya tentu aku harus belajar dan bekerja keras. Selama masa belajar dan kerja keras itu aku menimba banyak ilmu tentang hidup dan pertemanan yang semakin menguatkanku untuk tak pernah malu atau ragu dalam mengejar mimpiku. Aku juga semakin bisa menerima kekalahan. Dulu yang terasa sangat pahit dan suka menyalahkan pihak luar sekarang berubah menjadi introspeksi diri. Dalam kehidupan pribadi, hal tersebut sangat terasa. Belajar menerima kekurangan dan terus mencari tantangan sebagai pondasi untuk terus belajar.